The U.S. Department of Labor (DOL), in their publication Meeting Your Fiduciary Responsibilities, identifies “paying only reasonable plan expenses” as one of five key fiduciary responsibilities. Auto portability, by preserving participants’ retirement wealth, not only improves participant outcomes, but also moves the needle on key plan metrics, which in turn can drive a more efficient, lower-cost plan. To demonstrate how auto portability can lower plan costs, we would ideally observe the cumulative behaviors and outcomes for separated participants with less than $5,000 over time – both with and without auto portability – and compare the differences at a plan level. While that’s not practical in the real world, the Auto Portability Simulation (APS) model provides us with a tool to make those comparisons. The APS is a discrete event simulation that can model the behavior of millions of small-balance, job-changing 401(k) plan participants over a generation. For this analysis, the APS was re-configured to model a hypothetical plan with 10,000 active participants and to compare the results under two scenarios: 1) no auto portability and 2) auto portability. In the “no auto portability” scenario, 5,198 terminated participants with small balances leave their savings behind in the plan. As this population relocates, reaches retirement ages, and occasionally, dies – these “stranded” small accounts can cause major headaches for the plan, including returned mailings, uncashed distribution checks, missing participant search costs, and in some cases, plan audits – all of which can drive significantly higher plan expenses. By contrast, in the “auto portability” scenario, the plan will have no small accounts left behind by former employees and, for small accounts, will not incur the administrative burdens and expenses associated with missing participants and uncashed checks. Under auto portability, the plan sees a dramatic increase in the number of new participants who roll-in their small balances from prior plans. In our model, the appreciated value of these small-balance roll-ins exceeds $100.3 million, an amount that could eventually represent 10% of total plan assets. This increase in plan assets could make an important contribution to lowering plan expenses. Combining the results of the APS with the Deloitte Consulting study would yield a 2.2 basis point lower all-in fee, equating to cumulative plan savings of $2.26 million, over the duration of the simulation. Auto portability, by enabling the consolidation of small account balances – both into and out of plans – dramatically improves retirement outcomes for participants. 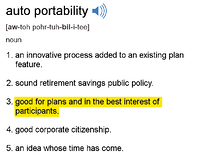 Auto portability creates more-efficient and cost-effective plans, which serve to lower plan costs and further benefit plan participants.